Trump Isn't a Nazi. But He's Thinking Like One. Ahead of the critical midterm elections, US President Donald Trump has redoubled his efforts to reshape democracy around nationalism and exclusion rather than liberalism and tolerance. 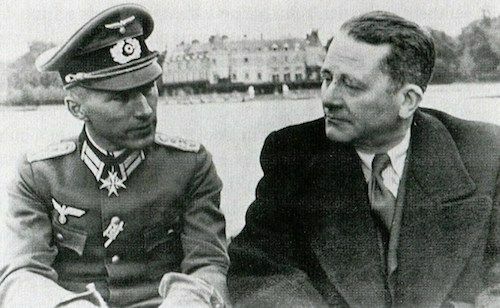 Carl Schmitt, the so-called ‘crown jurist of the Third Reich” who laid out the blueprint for Nazism, pursued the same goal. Schmitt, a political theorist, was frustrated by Germany’s weak international standing after World War I and its bickering Weimar Republic government. Just as Trump vowed to ‘Make America Great Again’, Schmitt desired a powerful German nation, governed by an authoritarian leader willing and able to take decisive political action. Like Trump, he recognised the country’s masses were angry, dissatisfied with the status quo and hungry for radical leadership. And just like the president, Schmitt spotted an opportunity to redefine democracy through persuasion and rhetoric rather than brute force. In Schmitt’s view, real democracy centred on a ‘friend-enemy distinction’ – framing your group identity in opposition to political opponents and competing ideas, rejecting anything and anyone that threatens your lifestyle, livelihood or comfort. Trump also seems to believe democracy is rooted in identity politics and fear of the ‘other’. The Nazis targeted Jews; Trump has fomented hate and distrust towards all those that criticise, undermine or threaten him - the FBI, the courts, the mainstream media – or white, conservative America: liberals, activists, Mexicans, Muslims and transgender people to name a few. His obsessive fearmongering over the caravan travelling from Honduras to the US border is the latest deployment of the friend-enemy distinction to rally support, under the guise of preserving American democracy. Trump also emulates Schmitt in his messaging of issues. Schmitt released popular, easy-to-read legal pamphlets containing straightforward arguments; Trump shares short, simple sentiments via tweet. Indeed, the president plans to connect with individuals through text message during his re-election campaign in 2020 – an almost intimate interaction between leader and voter. Like Schmitt, Trump has also relied on pithy generalisations to make his messages stick and spark emotional reactions. Schmitt called liberalism a state of “everlasting discussion” and famously said: “Tell me who your enemy is, and I will tell you who you are.” Meanwhile, Trump has coined terms such as ‘fake news’, painted large swathes of the media as hostile and dishonest, and even blamed Democrats’ inflammatory language about Republicans for pipe bombs being mailed to prominent progressives. Perhaps the most striking similarity between Trump and Schmitt is their disregard for political parties and parliamentary power. Schmitt wanted the Weimar President to act by presidential decree and bypass parliament, showcasing what he considered to be decisive leadership and democracy in action. Trump has bullied the Republican Congress into submission and surrounded himself with sycophants, allowing him to escape challenges and accountability. Free from checks and balances, he’s started a trade war with China, unilaterally pulled out of the Iran Nuclear Deal and now plans to eliminate birthright citizenship by executive order. It’s a stretch to call Trump a Nazi, but he’s certainly thinking like one.